The 556 MPS handheld instrument will be discontinued and we are no longer accepting orders for the 556. We will continue to support existing 556's for the next 5 years. We recommend the Professional Plus (Pro Plus) or ProDSS handheld instruments are suitable replacements. Featuring a waterproof IP-67, impact-resistant case, the YSI 556 MPS simultaneously measures dissolved oxygen, pH, conductivity, temperature, and ORP. Or, simply purchase the cable to measure DO, conductivity, and temperature if needed. The YSI 556 MPS conforms to GLP standards. 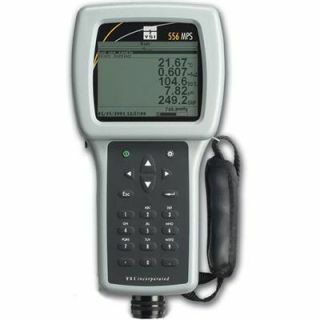 Multiparameter Instrument (carrying case (5061) and PC adaptor RS-232 included) used with the 556 handheld instrument. Optional Barometer: Internal barometer can be user-calibrated and displayed along with other data, used in dissolved oxygen calibrations, and logged to memory for tracking changes in barometric pressure. Carrying Case: The instrument comes standard with a soft-sided carrying case with enough space for the YSI 556 MPS, a 20-meter cable, and calibrating supplies. Pair the 556 up with the 5083 flow cell and you have a complete groundwater package. The 5083 flow cell is extremely simple to connect to the 556 and cleans up even easier! The 556 also features menu-driven operation with multiple languages including Spanish, French, Italian, German, Norwegian, and English. Data management is simple with EcoWatch™ desktop software for tabular and graphical data representations. If you're interested in multiparameter handheld sampling you may also be interested in the full-featured Professional Plus instrument or the ProDSS instrument with digital sensor technology. SKU 5563-4: 4-m cable with 3 ports; includes Conductivity/Temperature and DO Sensors. SKU 5563-10: 10-m cable with 3 ports; includes Conductivity/Temperature and DO Sensors. SKU 5563-20: 20-m cable with 3 ports; includes Conductivity/Temperature and DO Sensors.